In today’s digital society, there’s an app to help you manage practically every aspect of your life; from your finances to your weight management and calorie counting, there’s an app for that. Your executive job hunt is no different. Whether you want to work more efficiently with social media or job hunt on-the-go, LinkedIn’s applications will revolutionise your executive job hunt. 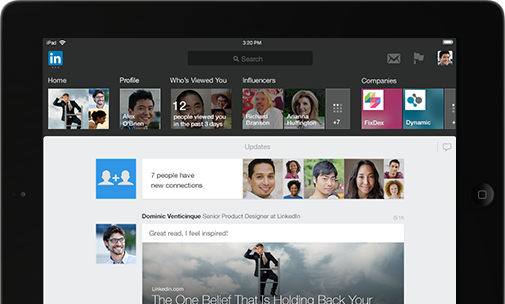 Revolutionise Your Executive Job Hunt With LinkedIn’s App! While LinkedIn is easy to use, it cannot be mastered in just a few sessions of use. The best users on LinkedIn are attentive and vigilant, updating their achievements and skill sets as well as timely replying to requests and comments. For the type of individual aspiring for executive positions, however, it is not always realistic to be able to afford the time to sit at a computer and perform this dutifully. There are the day-to-day duties of one’s current job to attend to, as well as the the personal and social obligations that have to performed. Luckily for these busy individuals, the world of recruitment has gone mobile. The LinkedIn app allows for mobility of job search activities and resources. This makes it easier to find work whenever and wherever it’s convenient; job hunting can become a regular component of your daily routine, rather than a specially scheduled activity. This will enable job searchers to access new contacts, new job postings and to take immediate action to be more successful in their searches. When looking for a job, tools such as LinkedIn will aide you in your networking and job search endeavours, however it is essential that you have an Executive CV that backs-up your career history, experience and suitability for any job, whether it be advertised or hidden. Unfortunately, many career websites are not fully optimized for mobile use. Even if mobile versions are available for use, job seekers are disappointed to find that they are often difficult to use in this manner. Job seekers become more likely to start shopping online instead of connecting with career opportunities if they cannot find a way to do this using mobile apps. By incorporating LinkedIn’s mobile options, you are guaranteeing that you are being as effective as possible with your time management. You are able to get ahead of other seekers who are only using the antiquated web resources of the past. You will be able to network and reach out to headhunters (headhunters article link) on the go, while the competition is doing nothing. Mobile apps are the future of computing. LinkedIn’s mobile apps in particular are leading the way towards improved recruitment efforts simply because these applications provide accessibility to job seekers and recruiters alike. They allow the right people to connect in real time, in the way that the world works now: on demand.